Taiwan has over 2,500 auto part suppliers, with more than 80% output value in export. The 2017 export volume reached US$ 7.1 billion, mainly to destinations such as the US, Japan, China, the UK and Australia, It accounts for 60% of total export, of which the US makes up the largest percentage at more than 40%. 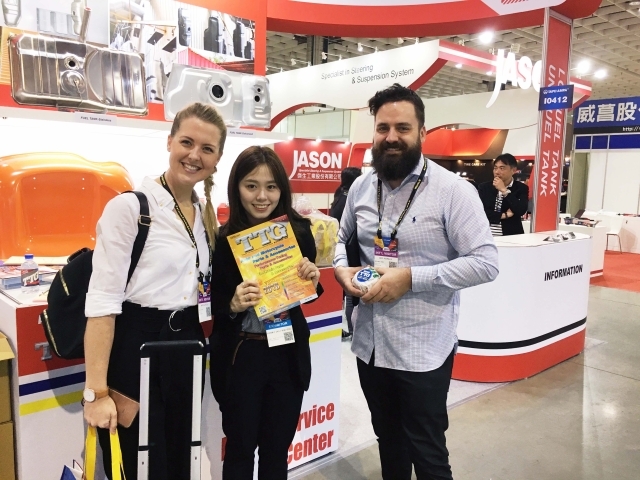 Once every two years auto part event that brings global industry together - Automechanika Frankfurt 2018 is a platform for Taiwanese suppliers who play a key role in the auto part supply chain worldwide. Led by the Taiwan Transportation Vehicle Manufacturers Association (TTVMA), Importers and Exporters Association of Taipei (IEAT), Taiwan Forging Association (TWFA), Taiwan Electrical and Electronic Manufacturers' Association (TEEMA), Chang Hua Importers and Exporters Chamber of Commerce (CHIEC) and Changhua County Industrial Association (CCIA), 471 suppliers are located in the 4.2 Auto Parts Hall and the 10.1 Tool Hall. They will demonstrate the most advanced and competitive products from Taiwanese companies. Collision parts, including plastic parts, sheet metal parts and car lights, are the popular items for Taiwanese companies. They account for 80% of the global after-sales service market, 70% of the global market and 33% of the sheet metal parts market. Tong Yang Group is the world's top supplier in AM plastic parts. Depo and TYC are world leaders in AM car lights, accounting for 60-70% of the US and European markets respectively. In addition, fuel tank system supplier LC Fuel Tank, chassis part supplier Hwang Yu, replacement part supplier ANTRC, Mega Lid and others, are all leading suppliers in their own domain. Automotive electronics are a rising star in the auto part industry, and have benefited from Taiwan's ICT industry advantages and complete auto part setup. Its 2017 total output value already exceeded US$ 6.7 billion. Advanced lighting systems, LED car lighting, night vision systems, tire pressure monitors, anti-collision radars, navigation systems and telematics are popular export products. Exhibitors include well-known sensor supplier Cub Elecparts and monitoring system supplier AutoEquips. In addition, auto part suppliers feature Sajones in brake products, Hsiang Lun in engine parts and Sican in heat insulation. All of them are leading auto part suppliers in Taiwan. Professional and diverse B2B media is an important driving force behind the successful entry of Taiwan's auto part products into the international market. Taiwan Transportation Equipment Guide (TTG), with its long history, professional content and updated information, has become the most trustworthy platform for buyers and suppliers. Located in booth P73 of Hall 4.2, TTG offers its latest issues, special newspaper columns and USB specials. Combined with CENS online network system, visitors can now access quality information on Taiwanese suppliers.